Resident killer whales are known to be fish-eaters, in contrast to transients that feed on marine mammals. Adult male killer whales in the North Pacific may grow to a length of approximately 27 feet (8.2 m), whereas females grow to an average length of about 23 feet (7 m). Adult males may weigh almost twice as much as females, up to 13,300 pounds (6,000 kilograms). Killer whales are predominantly black in color with large white patches under the jaw and above and behind each eye. Much of the ventral surface of killer whales is also white and there are large white patches which extend from the ventral area onto the flanks. A gray or white saddle area is often found behind the dorsal fin. This area is highly variable and is one of the characteristics used to identify individual whales. The very tall dorsal fin is characteristic of this species. The dorsal fin may reach 6 feet in height in males but usually does not exceed 3 feet in height in females. Killer whales are long-lived animals and reproduce slowly. Both males and females will have multiple breeding partners throughout their lifetimes. The maximum age which these animals can attain has not been determined but may be at least 50 years for males and 80 years for females. The annual birth rate has been estimated at 4 to 5 percent but may be higher following the deaths of several animals in a pod. In stable pods, some females may not breed at all. Much remains to be learned about the reproductive behavior of killer whales. Females are believed to become sexually active at 15 years of age, on average, yet that age can vary between 11–18 years. Young are born at intervals of three to eight years, although animals born in captivity have borne young 19 months apart. The gestation period has been estimated at 16 to 18 months. In the north Pacific, most births appear to occur between fall and spring. Killer whales are opportunistic feeders and have been observed to prey on virtually any large marine animal available. Resident killer whales are known to be fish-eaters, in contrast to transients that feed on marine mammals. For offshores, relatively few feeding observations are available, and the limited data indicate these whales appear to prey primarily on fish, including sharks. However, until the diet of offshores is better understood, the possibility exists that offshores may kill other marine mammals. Resident pods appear to feed primarily on a wide variety of fish such as salmon, herring, halibut, and cod. Transient pods may feed on any available species of marine mammal. The stomach of a killer whale found stranded near Prince William Sound contained a harbor seal, a harbor porpoise, and a Steller sea lion. Killer whales also have been observed preying on river otters, sea otters, squid, and several species of birds. Killer whales may briefly beach themselves to grab seals and sea lions from the shore. Animals within a pod often feed cooperatively. When preying on large animals such as gray or humpback whales, the killer whales may attack as a pack, tearing away at the prey animal from several angles. When preying on schooling fish, smaller killer whales may swim close to the beach to drive the fish from shallow waters out to the rest of the pod. Large groups of killer whales are often involved in hunting schools of fish. Smaller groups (two to eight animals) are more common when preying on marine mammals such as seals or porpoises. Little is known about the diving behavior of killer whales. Typical dive times last three to five minutes although this is highly variable, depending on the type of activity in which the animal is engaged. Three population ‘stocks’ of transient killer whales have been recognized in Alaskan waters: (1) the AT1 stock, which occurs from Prince William Sound west through the Kenai Fjords; (2) the Gulf of Alaska, Aleutian Islands, and Bering Sea (GOA/AI/BS) stock; and (3) the West Coast transients stock, which occurs between Southeast Alaska and California. The diet of AT1 transients is relatively well understood. Based on more than 20 years of field observations these whales are thought to feed primarily on harbor seals and Dall’s porpoise. The feeding habits of GOA/AI/BS transients are less well known in general and essentially unknown during the period from fall to spring. Observations of feeding by GOA/AI/BS transients have been limited to date, but observed prey include fur seals, gray whales, minke whales, and Steller sea lions. In addition to killer whale diet being relatively distinct among the three ecotypes, prey preferences may be also be region-specific. Thus, some groups of GOA/ AI/BS transients may specialize on certain prey species, as AT1 transients specialize on harbor seals and Dall’s porpoise. Killer whales migrate northward throughout the Bering Strait in the spring as the pack ice retreats. They leave the Beaufort and Chukchi areas in the fall when the ice advances. Killer whales occur in all of the earth's oceans and seas, yet most concentrations are found in cold temperate waters. They are found throughout the marine waters of Alaska but occur most commonly over the waters of the continental shelf from Southeast Alaska through the Aleutian Islands and northward into the Chukchi and Beaufort seas. Killer whales in the Pacific Northwest and Alaska occur in groups of animals called pods. Most pods in Alaska number fewer than 40 animals. The individuals that comprise each pod change very little. Killer whale pods are matrilineal and consist of a female and her offspring of both sexes. In the North Pacific Ocean three ecotypes of killer whales have been recognized by their genetics, morphology, acoustics, association patterns, and feeding ecology, including their prey. Differences in the movement patterns among killer whale ecotypes have led, in part, to their names, i.e., “resident,” “transient,” and “offshore.” Specifically, residents have the smallest home range and typically return each year to predictable locations, transients have larger home ranges and have less predictable movements as they transit through local areas quickly, and offshores have the largest home ranges that include areas farther offshore. During the 1980s, photo-identification techniques were used for the first time in Southeast Alaska and in Prince William Sound to estimate the number of individuals and pods of killer whales occurring in those two areas. Following the Exxon Valdez oil spill, these studies were expanded and carried out on a more systematic basis. Population assessment studies expanded further into the Gulf of Alaska and the Aleutian Islands in the late 1990s and early 2000s when predation by killer whales was considered by some a significant threat to the recovery of the endangered Steller sea lion. 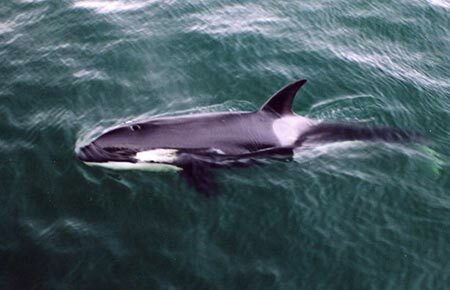 Based on results from this research, three population ‘stocks’ of transient killer whales have been recognized in Alaskan waters: (1) the AT1 stock, which occurs from Prince William Sound west through the Kenai Fjords; (2) the Gulf of Alaska, Aleutian Islands, and Bering Sea (GOA/AI/BS) stock; and (3) the West Coast transients stock, which occurs between Southeast Alaska and California. The abundance of the isolated AT1 stock declined from 22 whales in 1989 to only 8 whales in 2004 when it was designated as depleted under the Marine Mammal Protection Act. In contrast, relatively less data exist for the GOA/AI/BS transient stock, particularly for waters west of Kodiak Island, and preliminary estimates indicate their abundance may be about 500 individuals. Based on photo-identification studies, an estimated 323 whales comprise the community of West Coast transients, of which 105 whales are known to occur in California waters and the remaining 218 whales occur in the waters of Washington State, British Columbia, and Southeast Alaska. 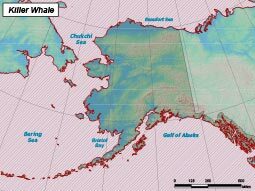 The Alaska Resident stock, which occurs from Southeast Alaska to the Aleutian Islands and Bering Sea, has a minimum abundance of 1,123 whales, the large majority outside of Southeast Alaska. The Northern Resident stock, which occurs from approximately mid-Vancouver Island (British Columbia) throughout most of Southeast Alaska, has a minimum abundance of 216 whales. An estimate of the abundance of offshore killer whales, which occur from California through Alaska, is not available. Systematic population assessment studies have not been conducted in the Bering, Chukchi, or Beaufort seas, and thus substantial numbers of killer whales, of each of the three ecotypes, may remain to be identified and counted. Humans are the only predators of killer whales. Killer whales have been taken throughout the world for meat and oil. Killer whales have also been removed from the wild for public display. In recent years, resident killer whales have begun removing black cod (sablefish) from longlines set by Alaska fishers. This has resulted in several of the animals being shot. Such shooting is no longer legal. Resident pods appear to feed primarily on a wide variety of fish such as salmon, herring, halibut, and cod. Transient pods may feed on any available species of marine mammal. Females give birth to one calf every 4–6 years. Killer whale pods appear to have their own unique, recognizable type of calls which do not change over periods as long as 25 years. To identify individual killer whales, biologists use identifying characteristics — size, shape, and distinctive scars or marks — of the dorsal fin and the gray “saddle patch” on the back behind the dorsal fin. Killer whales are harvested for oil and meat in some areas. Killer whales are prized by wildlife viewers as a viewing experience.